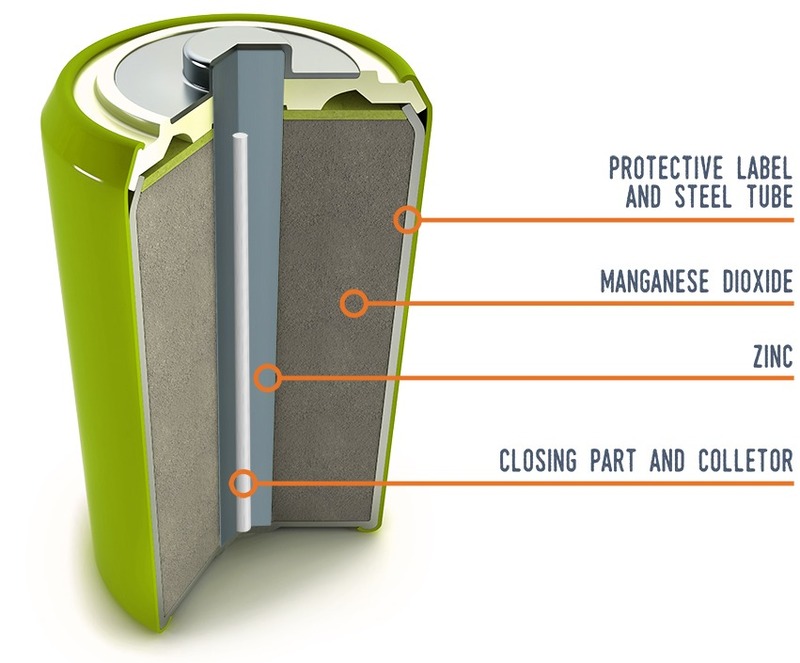 The steel tube insulates the chemical elements inside and circulates the electrons to the positive pole of the battery. It is recycled as steel scrap in electric furnaces in the steel industry to obtain new steel. It collects the electrons and sends them to the positive pole, through the steel tube. It is recycled, together with zinc, in rotary furnaces to extract new materials for the metallurgical industry. In addition, it has multiple applications as a filler and in construction. It makes the electrons circulate towards the negative pole (below) through the collector, made of iron that is in the middle of the battery and subject to the base. Like manganese, it is recycled in rotary furnaces to obtain new raw material. It can also be reused directly in the steel industry in galvanizing processes. It is located in the centre of the battery and channels the flow of electrons towards the negative pole. It is recycled as steel scrap in electric furnaces of the iron and steel industry to obtain new steel. What is the average recycling of the elements from an alkaline battery? PER TON OF ALKALINE BATTERIES COLLECTED, MORE THAN 300 KILOGRAMS OF ZINC AND 250 KILOGRAMS OF IRON AND NICKEL CAN BE RECOVERED, WHICH ARE USED TO MAKE ALL KINDS OF OBJECTS AGAIN: FROM FORKS AND TABLE SPOONS, TO CAR LICENSE PLATES, NEW BATTERIES AND PHOTOVOLTAIC PANELS.